José Filipe Torres, CEO of Madrid-based place branding advisory firm Bloom Consulting, in this post discusses the winners and losers of the Digital Country Index 2017. 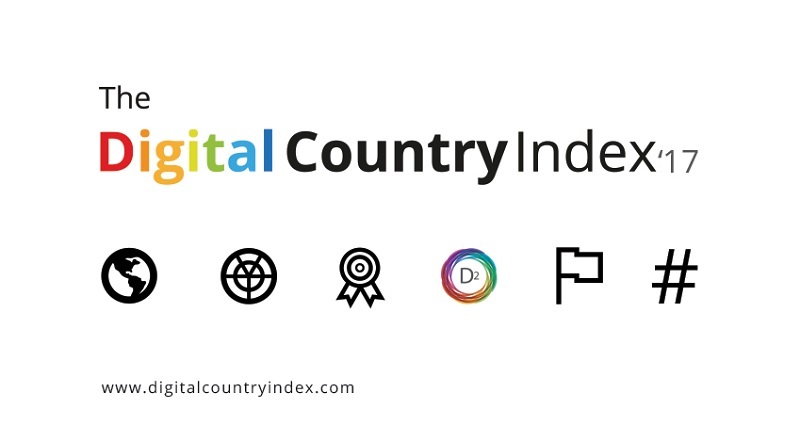 First presented in 2015, the Digital Country Index tracks the number of searches performed by all worldwide citizens toward any given country, in connection with six topic areas: tourism, investment, exports, talent and national prominence. José, which findings of the Digital Country Index 2017 did you find the most intriguing? United Kingdom as Number 1. The announcement that they would bid farewell to the European Union caused an uproar among the international public and a strong dynamic within the most recent Digital Country Index: The United Kingdom skyrocketed seven positions up the ranking and took first place. The country showed an excellent performance in all of the dimensions of the Digital Country Index (Tourism, Investment, Exports, Talent and National Prominence). Not surprisingly, searches performed towards the UK about International Relations went up by +229% in comparison to the previous year. This impressive increase is most likely related to the Brexit referendum. Part of the Digital Country Index is a sentiment analysis, in order to differ between positive and negative searches performed about a country. We found out that significantly more positive searches were performed about the United Kingdom last year than negative searches. This finding was very surprising, as we did not expect the Brexit referendum to have such a positive impact. That said, we’ll have to see if this “positive” trend is here to stay… I doubt it, however I was wrong several times about this. Which countries have seen the strongest increase in the Digital Country Index 2017? For me Canada is the big winner of the Digital Country Index 2017. Canada is currently in the 5th place and is the only country within the Top 5 which has managed to improve its performance in all of the five dimensions. Therefore, Canada can be considered an example of great nation branding. 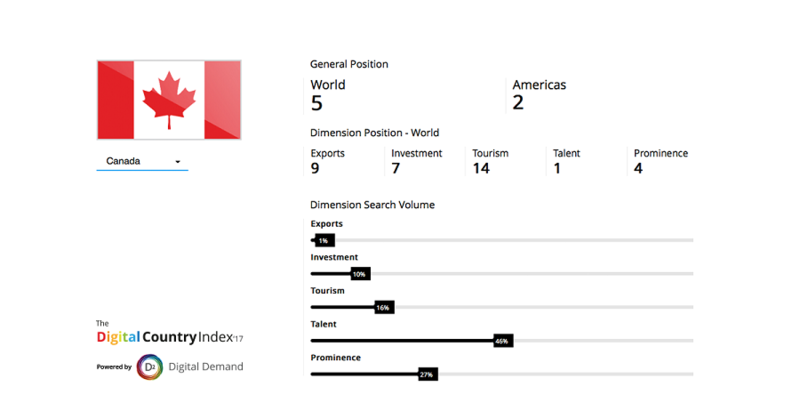 Canada’s performance in the Talent dimension is especially noteworthy, ranking first in the Digital Country Index 2017. The country’s success in this dimension was especially driven by its increasing appeal as a country to live in. Besides the United Kingdom, several other countries have seen a strong increase in their brand appeal. 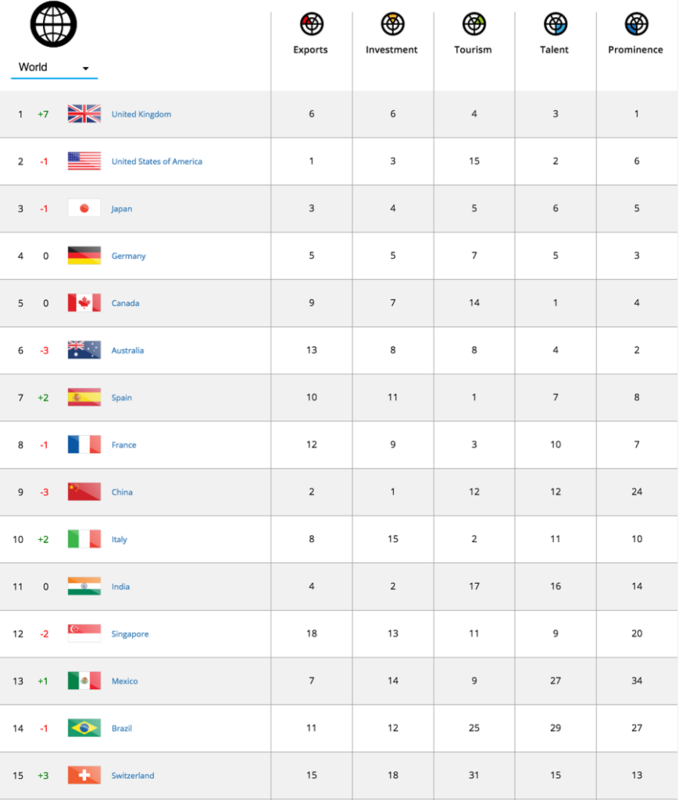 Japan dropped down the ranking by one position due to the winning streak of the United Kingdom and is now in 3rd place. However, Japan is highly competitive and has been experiencing an especially strong increase in its appeal with regard to investment and talent attraction. Which countries have seen the strongest decline? Before becoming President, every time Trump won more points in the elections or made an announcement, the world seemed to lose interest in the USA by stopping to search for living options in the country. Hence, the USA fell by one position in the Talent dimension. Furthermore, the country dropped by 5 positions in the Prominence dimension, because less positive searches related to the general image of the USA were performed. The numerous terror attacks that France has suffered recently have had a strong negative impact on the country’s positioning in the ranking. France has especially been on a downfall in the Talent dimension. Searches related to living and working there fell by -22%, in comparison to the previous year. Brazil experienced a strong decline in its Prominence dimension. Despite having hosted the 2016 Rio Olympics, the country fell by nine positions in Prominence, and by one position in the overall ranking. Brazil’s corruption scandals strongly influenced this downfall, as evident in the +58% increase in searches about “corruption” in the country. Following the publicity which surrounded the scandals, Brazil also lost three positions in the Exports dimension: Searches for goods “Made In” Brazil decreased by -44%, compared to the previous year. How does the Digital Country Index work in terms of methodology? All of the dimensions are composed of a total of 19 macro clusters of information, called Brandtag Families. Inside each Brandtag Family, there are around 132 Brandtags which are comprised of 44 million keyword combinations in 9 different languages (English, German, French, Spanish, Italian, Japanese, Portuguese, Russian, and Chinese), which result in approximately 799 million valid search results for 2016. The objective of the Digital Country Index is to provide the least subjective results possible. Therefore, the position of each country is solely determined by its search volume in each dimension (with the exception of National Prominence). We incorporate a qualitative input into the data by attributing equal weight to each of the five dimensions (20% to each dimension). Hence, if country A has five times more searches in the Tourism dimension than country B, but ten times less searches in the Talent dimension, country A will not necessarily score higher in the Index. For the Talent, Exports, Investment and Tourism dimensions a positive criterion is applied, meaning that a high number of searches performed towards a country will increase their position within the respective dimension. However, the National Prominence dimension requires a more complex approach, as a high number of searches performed towards any given country in the National Prominence dimension does not necessarily imply that all of those searches are positive. As an example, the reason for a global citizen searching for the term “corruption” in a specific country may be due a possible association with that country being either corrupt or not corrupt. In order to mitigate the duality of searches, the Index links the searches to external rankings to ensure the least subjective interpretation of data as possible. Which trends do you observe? The biggest trend that we have been able to observe in the Digital Country Index is that everything that happens offline (in the “real” word) nearly immediately has an impact on the digital world. Yesterday’s news is not “old news” anymore, but can remain online for many years. Because “old news” can remain accessible for such a long period of time, it can strongly influence the perceptions that global citizens have of a country. Find out more about the Digital Country Index 2017 here or learn more about Bloom Consulting here. Enjoyed this summary of key findings and trends of the Digital Country Index 2017 by Bloom Consulting? Spread the word!